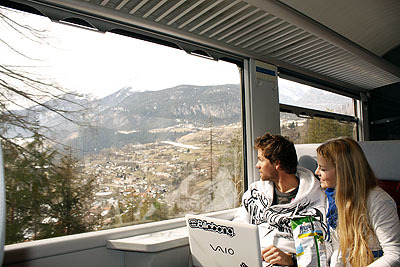 Relaxing on a train with friends or family, scenery gliding by as your ski resort gets ever closer is a great way to travel – a way to make the journey feel like it’s part of the holiday. 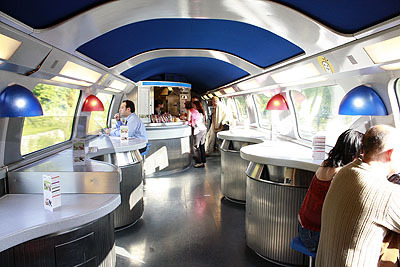 There’s more legroom than flying or driving, and you can get up and walk down to the cafe bar. As well as buying a meal and drinks there, you can also bring your own food and drink on board, so if you get a table seat you can create your own picnic. You can chat with friends, play games, read, watch films, work, snooze – the train journey is time to do stuff you enjoy on your way to the Alps. Think it’s faster to fly? Really? You aren’t alone – many skiers assume that it must be quicker to fly. But when you compare the journeys door-to-door, you might be surprised. For quite a few ski destinations, if you travel from close by London, the train travel can get you there as quickly as flying, as you’ll see in our plane vs train race (see video to the right). Flying might look quicker at first glance - London to Geneva, for instance, is only 2 hours on paper. But once you've added your journey to the airport, a 2-hour check-in time, delays, luggage collection, waiting for a coach transfer, and then the long road journey to the resort (which is frequently 3 hours), there is little difference between the train and plane. The difference is that the train journey has quality blocks of time that you can use, instead of moving from airport queue to airport queue to long transfer when you fly. By travelling on an overnight sleeper train on a Friday for example, you can wake up in the Alps and get the first of two extra days on the slopes – skiing on blissfully quiet slopes on transfer day - when everyone else is sitting in airport transfers. Most hotels or chalets will have somewhere you can leave your stuff and get changed. Those flying may have had to set their alarm clock early, but flying never gets you onto the slopes the day you arrive. At the end of your holiday, you can ski the whole day and then get an overnight train home. It’s a great way of using the travel time, and children always get excited by the idea of walking up in the Alps (well adults mostly do too, actually!). One of the joys of travel by train is that you can gaze out the window at a constantly unfolding view of the countryside. From St Pancras, the urban landscapes of north east London quickly turn to green as you whiz at high speed across the flat terrain of Kent. Once you emerge from the Channel Tunnel, the French countryside appears, featureless at first, then slowly becomes more interesting. Beyond Paris the countryside begins to undulate, vast lakes emerge and soon you find yourself amid the beauty of the mountains, gazing up toward snowy peaks. Some of the scenery in Austria and Swizerland, past lake Geneva and through the Arlberg Valley, is just magnificent. And you are sitting comfortably to take it all in. For families, train travel to ski resorts beats flying hands down. 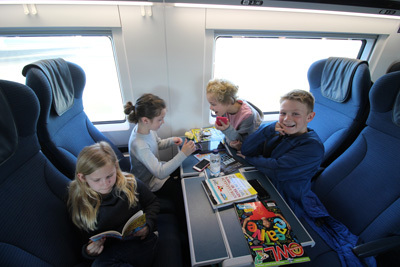 Children love train journeys, and once on board they have the freedom and space to stretch their legs and move around. There is always something new to see out the window and plenty to be getting onward on board. Families can book groups of 4 seats around a table - ideal for playing games, watching DVDs or drawing. 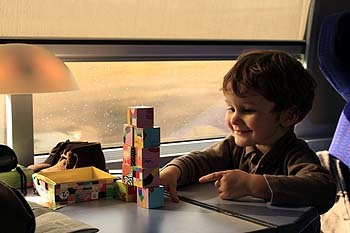 Children under 4 travel for free on all trains in Europe, including Eurostar, although they aren't allocated a seat. Under-11s get a discount on the adult fare. Some trains have family spaces and nursery facilities in standard class. On Eurostar it is possible for families to book seats in a dedicated carriage close to the front of the train and baby-changing facilities. It's such a fantastic way to bond - because you've started the holiday on the train, instead of in the resort. 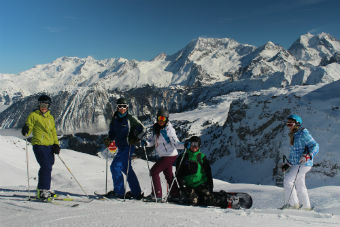 As you can see in this film Snowcarbon made, with Eurostar - where skiers share their experiences. We've got one planet, and we need to start taking care of it better. One of the big motivations for setting up Snowcarbon was the realisation that there are many (relatively) sustainable routes by train to the Alps, and yet mostly skiers were flying or driving. Often this was because they didn't realise how easy the train journey could be, or couldn't find the information they needed. The earth has limited resources, and yet we (in the West) are able to live with the illusion of abundance. But all the stuff we buy, all the petrol and oil we use, comes from somewhere, at great cost to people and planet. If we can minimise our use of it, then that's a good thing. Whatever mode of travel a skier chooses, travel takes time, costs money and creates traffic and carbon emissions. Snowcarbon was created to try to enable more skiers to travel to ski resorts by train, because rail travel to a ski resort creates only a fraction of the carbon emissions of the equivalent journey by plane or car, and can be a way to make the journey become an enjoyable part of the holiday. Research by Best Foot Forward (2011) has shown that typical one-way journey by plane to a ski resort creates around 122 kg of CO2 per person; a car around 240 kg of CO2 (per vehicle), but a journey by train only 12 kg of CO2 per person. In 2007 a study by French government agency ADEME and charity Mountain Riders found that 73% of the total carbon emissions of a typical ski resort result from transport of holidaymakers to the resort. A later study in 2011 estimated it at 64%. Either way, it’s a huge chunk - and shows how important your choice of transport method is. And the fact that you can have a better journey on so many other levels, means the train really makes sense for head and heart.